A few short years ago, simply writing useful articles regularly was enough to keep your audience engaged and see your SEO rankings steadily grow. Now, consumers are more demanding and the Google algorithm is more advanced. To accommodate both, you need to be always testing new tools and tactics. 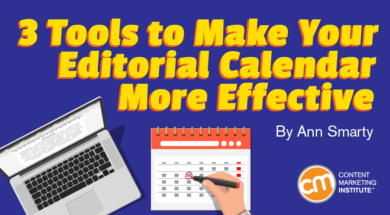 With content marketing becoming more complicated and integrated, your editorial calendar should grow up too. It’s no longer enough to document your planned content assets. Today’s editorial calendar should involve team collaboration aspects and advanced analytics steps to make higher-level content management possible. This roundup features three innovative tools to create a new content marketing routine to better adapt to an ever-changing digital marketing world. On-demand content like webinars, demos, video lessons, etc. With all those multiple and diverse content assets being created and so many (remote) teams being involved, how can you ensure that each of them is marketed effectively? 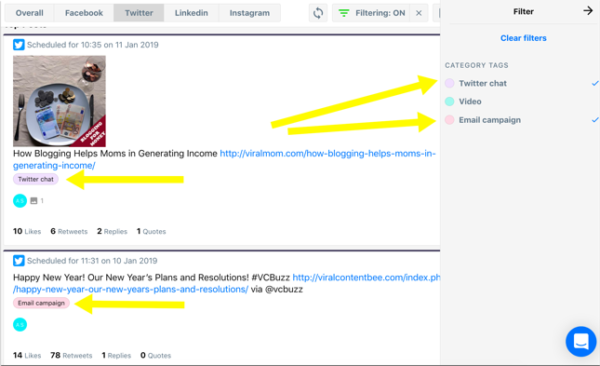 Your team can add updates to your calendar using the “Pinboard,” then you (or your social media manager) can drag and drop updates throughout the calendar ensuring both content diversity and balance. 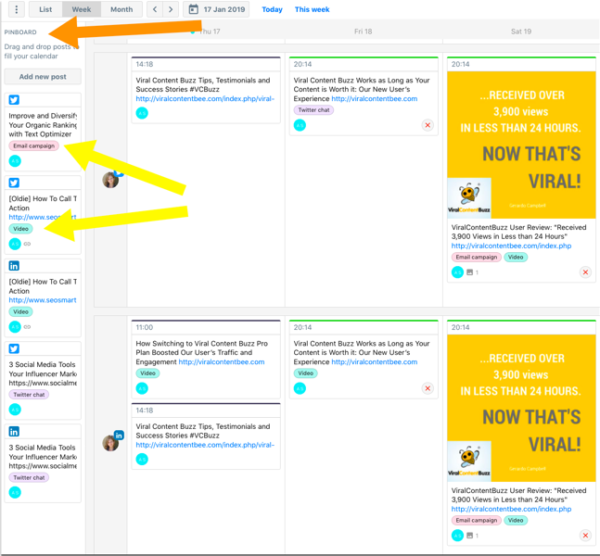 It’s helpful because the Pinboard can be the central point for each team member to craft updates for each content asset they are responsible for (press releases, interviews, videos, articles, etc.). The calendar uses color coding to help you quickly see how your content types and assets are spread out throughout a week or a month. Overall, ContentCal provides a clutter-free dashboard encouraging you to build both diverse and balanced editorial calendars. Content marketing involves so many tasks and steps (e.g., planning, outreach, writing, link acquisition outreach, social media promotion), that it can be hard to identify the steps that really impact your ROI. Not many solutions can collect, aggregate, and analyze all your data in a way that allows you to understand which of your micro-tactics work. 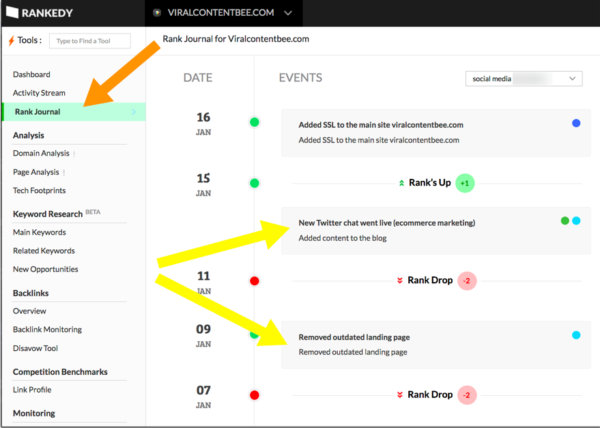 The only solution I have found is Rankedy’s Journal feature, which records all the little things happening to your site and content and shows Google ranking movements after each change. Rankedy also uses color coding to help you easily distinguish between content formats you created and change types you implemented. This feature makes it easy to find micro-tactics that work for your content and capitalize on those. Content marketing offers great lead-generation opportunities. Many customers who discover your brand through your content are not ready to buy but may be willing to opt in to download your brochure or white paper. How can you catch or keep their attention? Advanced (content) personalization is the answer. In fact, Segment found that half of consumers expect a personalized experience when interacting with brands. Personalizing your content means meeting your customers’ expectations. 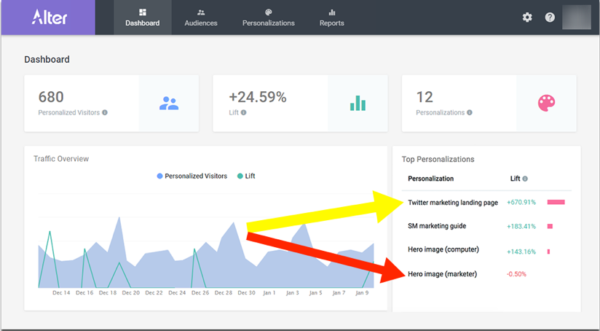 Yet, a report by Pure360 revealed that most brands still fall behind in marketing personalization, so now is a good time to boost your digital marketing performance with personalization. Alter (paid version) is a new solution for small businesses allowing you to easily create and integrate personalized user experience sitewide (including your home page, landing pages, content pages and more). To use Alter, simply create a trial account, add its tracking code to the site, and use the visual editor to personalize your pages. Alter has an incredible number of parameters to define your audience for personalization. Examples include traffic sources, users’ interaction with the site (e.g., how many pages they viewed), users’ interaction with a specific link or call to action, their devices, etc. You can combine any of these parameters to create even more tailored experiences. 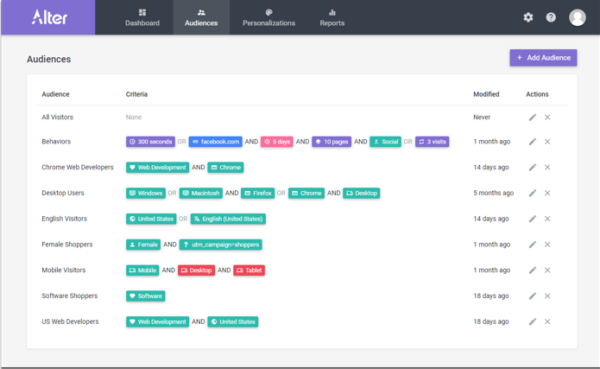 ContentCal, Rankedly, and Alter are new tools in the industry and provide a fresh look into how you can manage and analyze content. Adding these micro-management tasks to your regular to-do list is the best way to ensure that the tools will help you rethink and reestablish your content marketing routine to the maximum capacity. If your team is smaller, you can manage this system with a reusable planner in Google Spreadsheets or simpler to-do list management tools. For larger team management, you may need a more advanced collaborative solution. I use Serpstat (paid versions) checklists. You can create and reuse a template for each upcoming content asset and the team can check off their tasks until everything is done. A new checklist – based on the same template – is set up for each project (e.g., an article, an infographic, an influencer interview). You can break each checklist into sections to cover all the steps before, during, and after the publication process (e.g., keyword research, writing, designing graphics, proofreading, social media marketing, and outreach). Once everything gets checked off, the project is considered complete. You can read more about Serpstat checklists here. Are there innovative content marketing tools you’ve discovered lately? Which ones get you most excited? Please share them in the comments. Join us this April to learn more about how technology and content can work better together. Register today for ContentTECH using code BLOG100 to save $100.